Here is an explanation of how to create an Azure SSIS Integration Runtime (IR) and install SentryOne Task Factory during the start-up process of the IR. Currently, the only way to install third-party SSIS components such as Task Factory is by creating a main.cmd batch file that will run the installation and licensing commands during the start-up process of the Azure SSIS IR. You can read more about the general process of custom start-up scripts for an Azure IR here. USPS Address Verification won’t work. Unless you install Excel on the ADF IR, Task Factory Excel Power Refresh Task won’t work. You can install Excel via the installation script explained below and in the link above. There isn’t a trial version of Task Factory to run on ADF SSIS IR at this time because of the way the IR handles the installation and licensing for third-party components. Before you can activate your Task Factory license, you’ll need to obtain an ADF-ready license by emailing us. Licenses are available in 2,4,8,16– and 32-node versions. You’ll need to select the license based on the number of nodes your SSIS IR will contain. 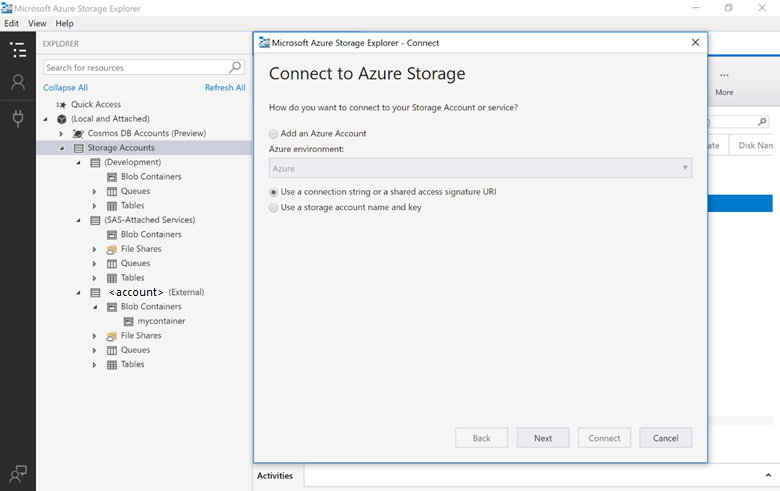 To get started, create a new Azure blob storage container. 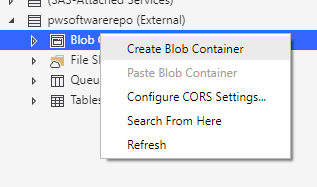 To do so, open Azure Storage Explorer, browse to your blob containers, right-click Blob Containers, select Create Blob Container, and name your blob. 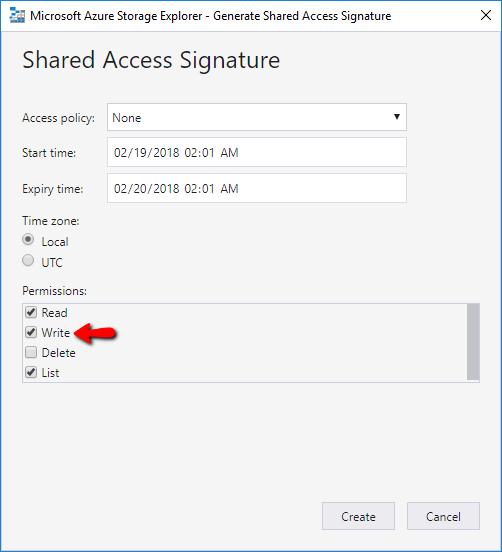 Under (Local and Attached), right-click Storage Accounts, select Connect to Azure Storage, select Use a connection string or a shared access signature URI, and then click Next. Click Next and then click Connect. Download the azure-configure-ssis-ir-taskfactory.zip file and extract the contents. with your Task Factory activation key. If you don’t have your key, please contact support@sentryone.com to obtain your key. After you’ve added your key, upload your edited cmd file, TaskFactory_Install.exe, and PragmaticWorks.LicenseManager.Console.exe to your blob storage container. Your storage container should look like the following screenshot. For the Azure IR to be able to see the files shown in the previous screenshot, you’ll need to provide a SAS to the script. 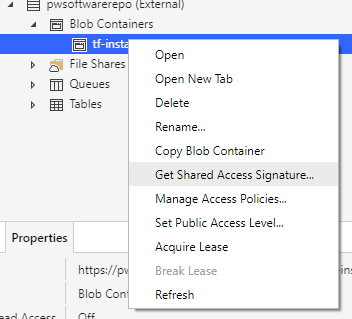 To create your SAS, right-click the blob container you just created and select Get Shared Access Signature. You’ll be prompted with the dialog box shown below. Select the Write option in the Permissions section. Otherwise, the installation process can’t write a log file for the main.cmd, Task Factory installation, and activation processes. Set the Expiry time to exactly one year from the current date and time. Click Create and a URL will be provided on the next screen. Copy and save that URL temporarily. You’ll use the SAS URL you just created as you go through this tutorial. The specific step you’ll use the URL on is Step 4 (Advanced Settings). Note that the tutorial doesn’t mention that you’ll need an Azure SQL Server instance that doesn’t have an SSISDB database on it. If you have an SSISDB database on the SQL Server you provide during the process of creating your Azure IR as you follow the tutorial, the IR creation process will fail. Therefore, every time you want to create an SSIS IR, you need to either delete the current SSISDB (if it’s not used) or create a new server without an SSISDB database. The Microsoft tutorial assumes you’ll create a new SQL Server each time you create a new Azure SSIS IR. 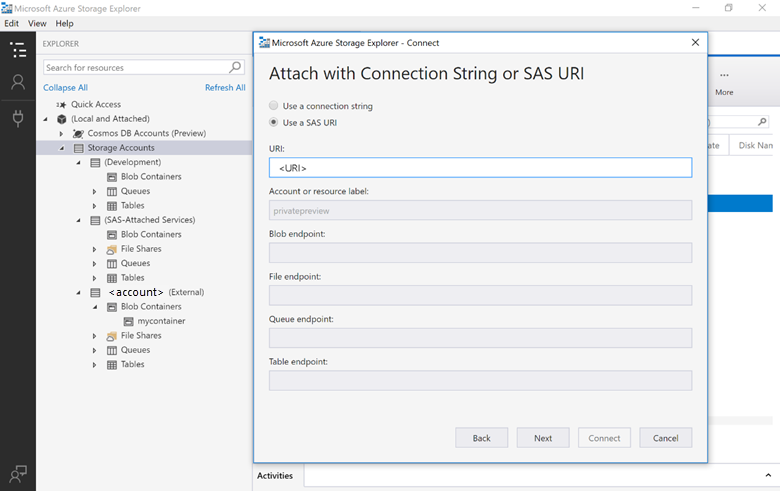 Follow the tutorial to set up your Data Factory and Azure SSIS IR instance. After you have created the Data Factory, you'll see log directories created in your blob storage container. Any log files will be located under the main.cmd.log directory. If you had Storage Explorer open already, you might need to refresh the window. Review the log files for any errors. If you don’t see any errors, you’re good to go. Note that you shouldn’t have to review the Task Factory installation log unless you run a package with Task Factory and receive a specific Task Factory failure message. Now that your Azure IR has been created and Task Factory is installed, you should be able to take any package created locally in SSDT, deploy it to Azure IR, and execute it successfully. To deploy your packages to your Azure IR, follow this tutorial. Note that you must have the latest version of SQL Server Management Studio (17.2 or above) installed to follow the tutorial and view the Integration Service Catalog. If you encounter any issues while installing or activating Task Factory in your Azure SSIS IR, please don’t hesitate to contact our support team at support@sentryone.com.